The Rolls Royce Ghost, to be unveiled at September's Frankfurt Motor Show, will receive a brand-new 6.6-liter turbocharged V12 rated at 563 HP, 575 lb-ft of torque and have a 0-to-60 time of 4.7 seconds. Also, here's the latest crease-tease. The folks obsessed with luxury from Goodwood have released and confirmed some specs on the new model set to be unveiled at the Frankfurt Motor Show in September along with a new shot of the door crease in the teaser photo above. Does that line look familiar? It should — we've seen it already in the RR4 concept. Rolls-Royce Motor Cars has confirmed headline performance figures for Ghost, their new model which will be unveiled at the Frankfurt motor show in September. The Ghost will be powered by a brand new 6.6 litre turbo charged V12 engine unique to Rolls-Royce. This engine will produce 563 bhp, delivering a 0-60 mph time of 4.7 seconds and a governed top speed of 155 mph. The engine is combined with an 8-speed automatic ZF gearbox. 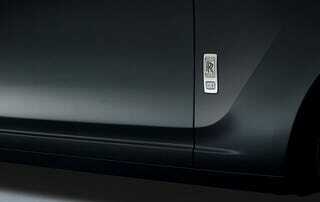 Rolls-Royce Director of Engineering, Helmut Riedl said, "First and foremost Ghost is a Rolls-Royce. This means that despite its extraordinary performance figures it has been engineered for effortless composure and refined power delivery. This is illustrated by the significant levels of low down torque available which makes pulling away very smooth and for an exceptionally relaxed driving experience. Riedl continues, "Rolls-Royce power is entirely different to anything else in the automotive world. It is delivered free from stress and exertion but at the same time must engage the driver. Ghost is about fingertip control while still enjoying a dynamic connection with the road. Equally passengers need to be cosseted from the physical sensations of acceleration, braking and cornering. Our chassis set up keeps Ghost stable and flat, preventing it from wallowing or pitching in the corners or imposing undesirable forces on those inside." Rolls-Royce has already confirmed that the Ghost will ride on an intelligent four corner air suspension system using multi link aluminium front and rear axles. The fully integrated system allows each of the Ghost's dynamic handling systems to work together in harmony, providing the optimum levels of refinement and comfort at all times. The vehicle acoustics also play a vital role in creating the authentic Rolls-Royce environment. Naturally engine, exhaust and even tyre noise have been engineered to be inaudible as far as possible, both internally and externally. Rolls-Royce Motor Cars Chief Executive Officer, Tom Purves, said, "Ghost is not about a single superlative but rather a careful blend of attributes. A Rolls-Royce should carry its power with grace, agility and refinement and this is never achieved by a focus on outright performance. Mastery comes in creating a balance and having driven the Ghost again recently I can say confidently that our engineering team has achieved this in fine style." Customer deliveries of Ghost in the UK and Europe will begin late in 2009 with pricing from £165,000 excluding taxes and delivery charges. Customer deliveries in other markets including the USA and Asia Pacific region will begin from the second quarter 2010. A full technical specification will be released later in the year.